Zooble Technologies can take the hassle out of buying and implementing your hardware and software, ensuring that all purchases are competitively priced, appropriate for your needs and compatible with current or projected IT infrastructure. 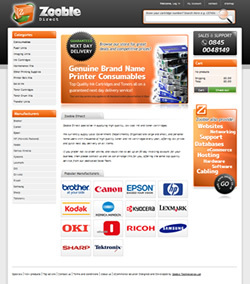 Our relationships with many major IT distributors and vendors means that we can supply and support IT hardware, software and consumables from the world's leading vendors including: HP, Toshiba, Dell, Brother, Cisco, Microsoft, Citrix, BT, Apple, Epson etc., ensuring that you not only have a wide range of products available to choose, but that you can rest assured they will be competitively priced. offer a post-sales service to pre-configure PCs and servers for installation onto an existing network (access rights permitting), eliminating the time consuming and costly process where full implementation solutions are not required. take the product from concept and procurement through to delivery, implementation and user training (on-site or remotely) if required. Contact us now and let Zooble provide you with an alternative quote to your current supplier, enabling a one-stop shop for all hardware, software and consumable requirements!